Casual Friday: What TV Show are you "IntoNow"? There's nothing better on a cold and snowy casual Friday than grabbing a blanket and settling in for a day of game shows and soap operas. Ok, well maybe not exactly game shows and soap operas, but you get the idea. 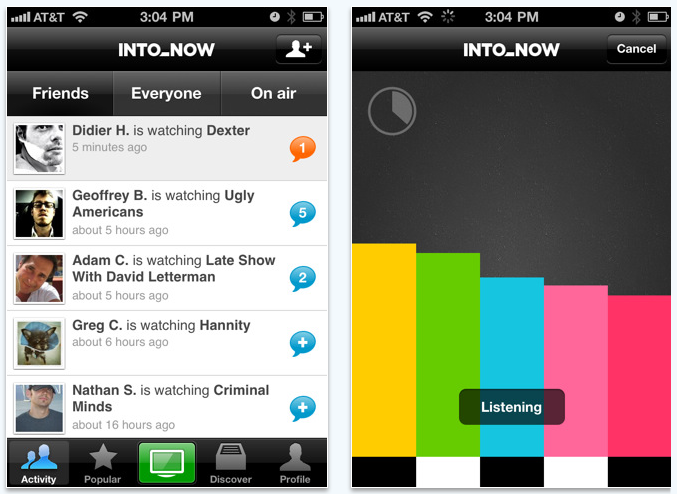 Today we're taking a look at a new app called IntoNow which is basically a combo of Shazam & Foursquare for television. I simply open my IntoNow app, push the green button and hold it up to my television. In about 20 seconds it not only tells me what I'm watching, but also the title of the episode, the season and episode number, what channel it's on and a small description of the episode. From there I can share on Facebook and Twitter or link out to Netflix and add it to my queue or buy it on iTunes. IntoNow allows me to see what my friends are watching and if it's "on air" now so I can flip over and watch, too, and discuss the show with them. I wish this had been around during Lost! I can also see what's popular in the IntoNow community. The current top three favorite shows are: Family Guy, The Office and SportsCenter. I love that when I was creating my account, the form where it shows first and last name was pre-filled in with "Chandler Bing". A TV app for the fans by the fans. And by the way that's Ms. Chanandler Bong. IntoNow uses an indexing technology called SoundPrint which can recognize a program even if it's airing live for the first time. And they've indexed more than 140 million minutes of previously aired shows--that's 266 years worth of video!